For three months we shopped the walking deck with anyone at TWLER (The World’s Largest Electronics Retailer) who would listen. We were seeking support and feedback on the direction. We were ensuring, at the least, that people had heard of us and knew we were actively pursuing a rewrite of TWLER.com. As we knew, there were three other teams that were trying to gain the necessary momentum to do the rewrite themselves, and we had to stand out and move faster. We made progress, occasionally teams would actually ask us to come review our plans for TWLER.com, or recommend others to hear the story. I said I was bad at Power Point and now I’ll prove it. 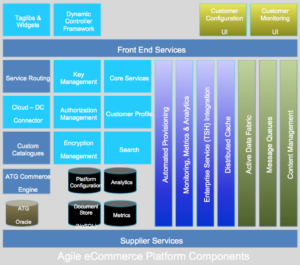 Here’s one of the first drawings of what we termed our Agile Ecommerce Platform made in 2011. Gradients seemed to be a thing in 2011 and the Platform drawing made great use of them. 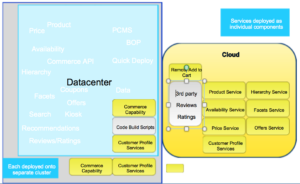 There were other similarly horrible slides that animated the move from monolith to component based system deployed into a cloud. Here’s one of the slides that showed the changes, sorry that the animations aren’t available and the translation to newer PPT didn’t work well. Overall the quality of the slides didn’t matter, the ideas mattered and more importantly, the credibility of the presenters was what ultimately made the difference.